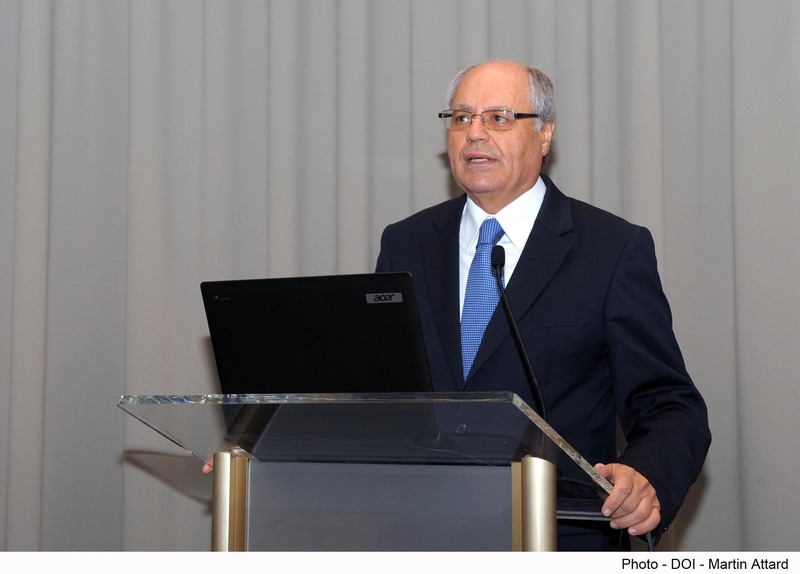 Faced with criticism that the middle class was forgotten in the Budget, Finance Minister Edward Scicluna says the exercise is part of a five-year plan and cannot be viewed in isolation. The Labour Party was under pressure by its traditional voters to deliver a more social Budget after three years of wealth generation that did not reach everybody. How did this influence your choices? The pressure was from day one because after 25 years they now had their own government and expectations were running high. It was more difficult then, to explain that the government had a plan with certain priorities. In order to arrive at them we had to address other sectors first, especially the middle and high income sectors. Of course, they did not understand and they could have felt abandoned. Budget 2017 has to be viewed within the context of a four-year plan. It cannot be taken in isolation as the Nationalist Party is trying to do when it asks why the middle class was left out of this Budget. The first Budget was aimed at creating work opportunities by proposing a raft of incentives to encourage people to enter the job market by making work pay. We also cut income tax for those earning less than €60,000 to 25 per cent from 35 per cent and introduced free child care for all. The second Budget provided incentives for those who worked but did not earn enough, which is why we introduced the in-work benefit at €1,000 per child for those parents who worked. The third targeted those on social benefits by offering to taper off State handouts when they started working. These measures were successful in creating work and reducing the hardships of the working poor. We had 3,500 people previously on social assistance and who have now found work. 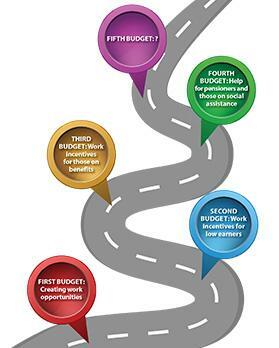 Budget 2017 was the next step to help pensioners and those on social assistance. The reduction in the top income tax rate from 35 per cent to 25 per cent between 2013 and 2015 left more than €40 million in people’s pockets. The whole package of measures to alleviate poverty and improve the situation for the elderly in the Budget you just presented will add €26 million to the pockets of the vulnerable. Would you still call this social justice? There are fewer people on the lower band than on the normal upper band. It is not a 50-50 split so the raw numbers are incomparable. We measure income distribution through various statistical methods. Eurostat uses the median income and the deprivation index to measure at-risk-of-poverty and this figure had been increasing up to 2012, stopped growing in 2013 and dropped in 2014. Last year you were criticised because measures aimed at pensioners targeted those earning the minimum. Pensioners across the board were targeted this year. How meaningful is the package? Each year the finance minister has a limited amount of resources to spare for new policies. Every year, expenditure increases by around €175 million. Out of this amount, around €150 million are automatic increases as a result of demographic changes, increased health expenditure, cost-of-living adjustments and so on. The other €25 million is the package available to cater for other policies and measures. 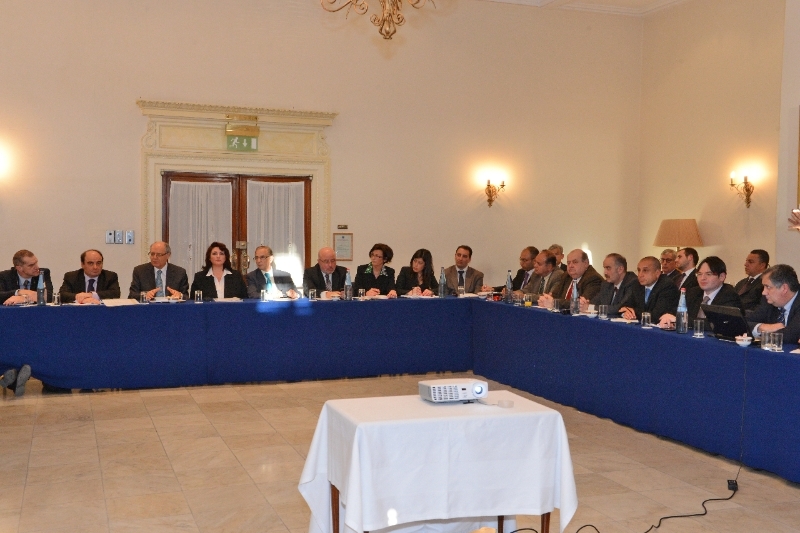 The pensions working group had suggested improving the situation of today’s pensioners, starting from those over 75. We opted to target those on the minimum pension last year, irrespective of age. Middle income pensioners were unaffected by the decision. 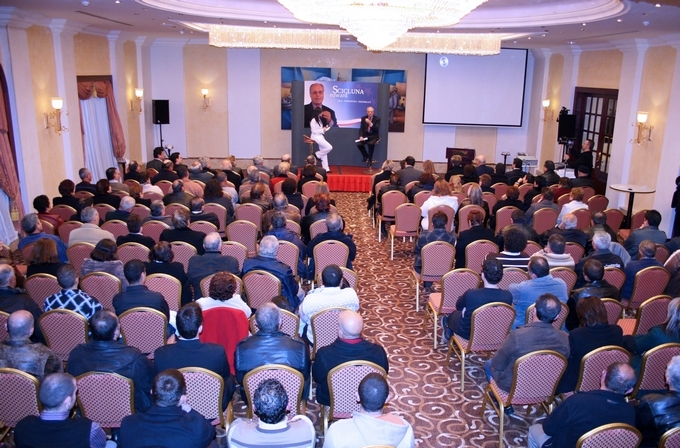 But this year we addressed their needs as well and started the process to make their pension tax free. Will the changes make a difference to their lives? Definitely, because while speaking to them it is clear that every euro counts. But we also ad­dressed other sectors such as carers who look after members of their family, by raising allow­ances and widening the criteria for eligibility. Do you have less and less manoeuvrability as you cut the deficit? The growing economy compensates for the fact that we are reducing the deficit. 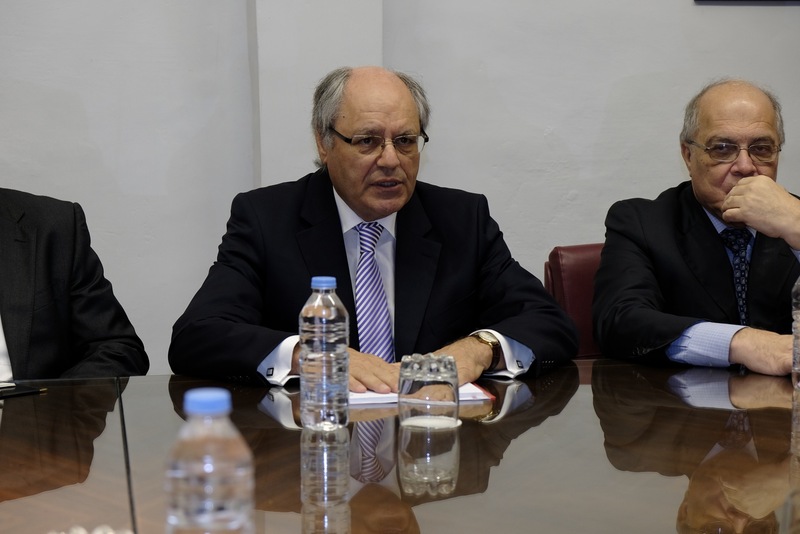 Each year I do not have the prerogative of writing a cheque to myself, as previous finance ministers had, to take initiatives worth millions of euros and become popular at the expense of a rising deficit. We committed ourselves to reduce the deficit until it disappears altogether. This is important for the economy’s reputation. Yes, there is more restriction, however, each year I have allocated a proportion of the resources for new measures. You cannot do everything in one year and this time it was the turn to continue addressing the poverty issue, including pensioners. But as far as pensioners go we targeted all classes and not just the poor. Poor pensioners do not pay income tax or invest on the stock exchange or worry about passing on property to their children. We have addressed all these for middle income pensioners while improving the minimum pension and supplementary allowances. You could expect more pressure next year to create more room for manoeuvrability in what is likely to be the last budget of the legislature. That is true. However, if anything, this government started with a Budget that was described as a pre-election Budget. The second and third were also described so. If we had to be tight-fisted in the first two years and be spending more towards the end, the economy would not have grown. We were generous where we thought it would give us a good return. We were very generous with the free childcare – it costs us more than €11 million – but it is giving us a good return. You increased the rent subsidy for low income earners and will be asking for rental contracts to be registered for people to benefit from the increase. There is fear this will backfire on the very people this measure is intended to help as landlords will want to increase rents. Did this figure at all in the equation? It did. In fact, if we made rent registration compulsory, landlords would have even evicted people. Registration is not compulsory and we are asking people to use their discretion. Do you want the government to double your subsidy? In that case, try and convince your landlord to register the contract. If you do not want to go down this road, you will still retain the existing subsidy. We are against irregularity, and the joint enforcement task force will do their homework in their own way without putting the onus on the vulnerable tenant. Have you shunned any form of rent control that poverty campaigners have been asking for? Yes. We’ve studied the disaster left in so many European countries. There will be many ways how to go around rent control: landlords could use the excuse of furnishing an apartment with the barest of minimum and ask tenants for a €1,000 upfront payment. But it also gives the wrong signal to developers that rents are controlled and this will stifle the building industry. You have gone for a pilot study on seven-year contracts for affordable housing by offering landlords a fiscal incentive if they enter into long-term arrangements with tenants? This came from the Malta Developers Association. We will be publishing details on which contracts would be eligible for this scheme that could see landlords benefit from a reduction to five per cent, from 15 per cent, in the final withholding tax on rental income. Has the rent withholding tax introduced two years ago worked? It has worked because there was a response but it was not as big as we would like it to be. There is still tax evasion and this is why we have set up this joint enforcement task force. €8 million were voted as a first tranche to start addressing historical injustices and anomalies. How many people will this measure impact? There are various pockets totalling a few hundred. Even though the government can argue that it could legally win the case or resort to time-bar as an excuse, like the previous admi­nis­tration had done, we decided to act differently. These people are really hurt. We told these groups that it would cost hundreds of millions to satisfy all their demands. This is an impossible sum, so they have to lower their expectations if they really want something. They have to be reasonable. The other point that prevented us from solving this earlier was that Eurostat deficit regulations mean that any claim the government recognised would have to be written down in that year. Instead, we created a fund, in which the government puts money according to what it can afford. This year we put €8 million, next year it could be €6 million or €10 million. Each year, a board would allocate payments and make sure that over a number of years these grievances are addressed. Have the grievances been prioritised? They will be prioritised by the board. This could also be seen as a vote-catcher. Anything that is good adds votes but it is not the intention. It [anomalies] is a festering problem, which hurts a lot of people and causes many sleepless nights. They feel an injustice was perpetrated in their regard… the hurt is real. Government expenditure in real terms keeps rising year after year. Alfred Sant has warned that expenditure commitments could come back to haunt the government when the eco­nomy stops growing at its current pace. Is he correct to sound this cautionary note? I sound this warning every day here. I can’t agree more. However, when the Budget is finally agreed, it is agreed within those parameters. Can the economy keep going at its current pace? It is not just me but the rating agencies that are convinced of this. This is what convinced them to upgrade us. When the upside and downside risks are balanced it is fine. We are riding a wave that is not a boom or a flashpoint. It is a result of the investment coming in: the American University of Malta will be opening its doors next October – that is Jordanian investment in a completely new sector offering education to the region; the Huawei pilot project, which is Chinese investment; the Qatari investment in Banif Bank, which can open more opportunities; the UK and Singapore investment in the three hospitals [St Luke’s, Karen Grech and Gozo hospitals]; the Crane Currency investment from the US; and finally the Vista Jet expansion in Malta. This is a varied portfolio of investment coming from all over. Some people cannot see it but for the outsider examining countries for investment opportunities, Malta is doing really well. There is enough investment happening to keep the economy going well for the foreseeable future. 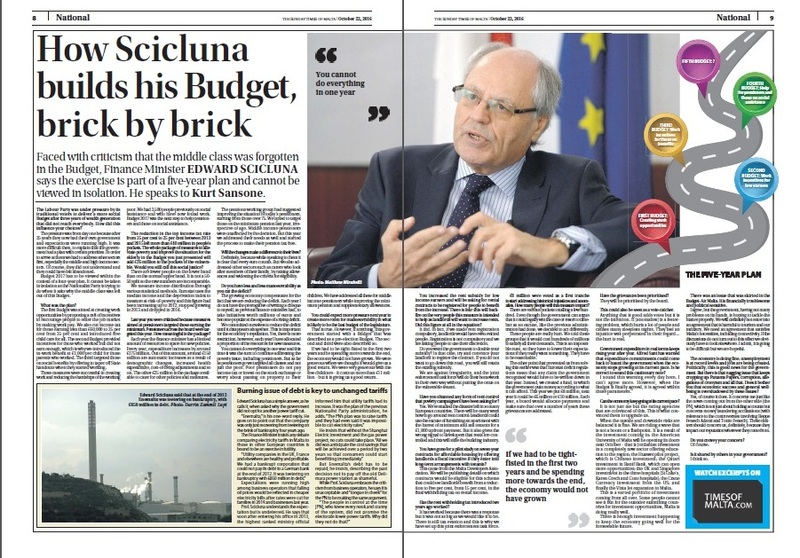 There was an issue that was skirted in the Budget: Air Malta. It is financially troublesome and political sensitive. I agree, but the government, having not many problems on its hands, is hoping to tackle the matter properly. We will definitely not enter into an agreement that is harmful to tourism and our industry. 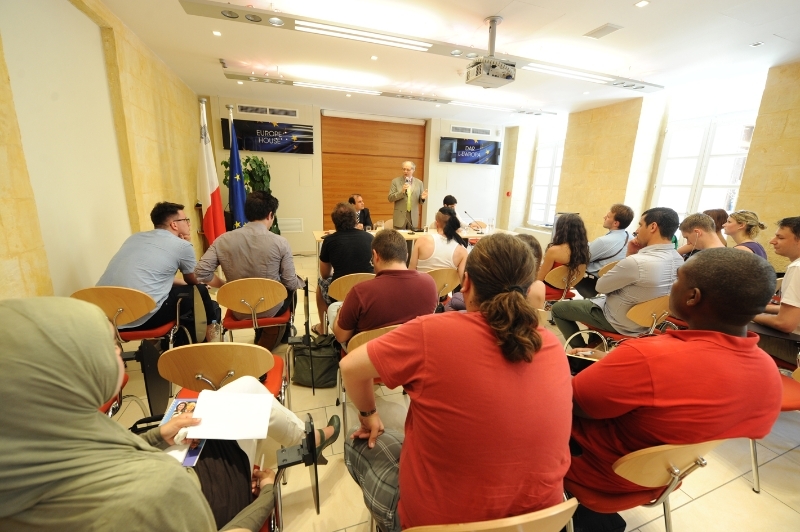 We need an agreement that satisfies Malta’s necessities, including connectivity. If the discussions do not turn out to this effect we obviously have to look elsewhere. I admit, it is going to be difficult but we are hopeful. The economy is doing fine, unemployment is at record levels and jobs are being created. Politically, this is good news for the government. But there is that nagging issue that keeps cropping up: Panama Papers, corruption, allegations of cronyism and all that. Does it bother you that economic success and general well-being is overshadowed by these issues? Yes, of course it does. It concerns me just like the news coming out from the other side [the PN], which is not just about holding accounts but concerns money laundering accusations [with reference to the controversies involving Beppe Fenech Adami and Tonio Fenech]. These matters should concern us, definitely, because they impact our reputation wherever they come from. Do you convey your concern? Is it shared by others in your government?